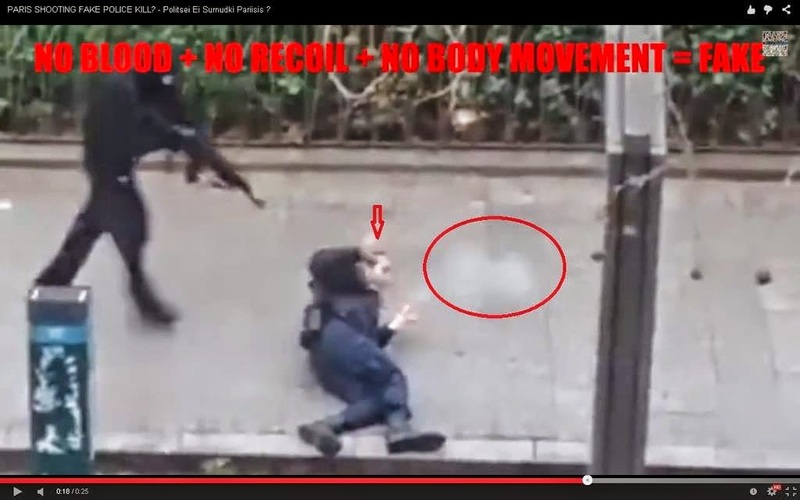 Home > YOUTUBE > CENSORED VIDEO : PARIS SHOOTING - Politsei ei surnudki Pariisis ? CENSORED VIDEO : PARIS SHOOTING - Politsei ei surnudki Pariisis ? You need to check out this footage about the cop who gets shot on the ground! firstly, a 7.62 would have made a massive mess from close range, second the splash from the bullet on the floor is easy 3' from the guys head! seriously . Sa pead lihtsalt seda nägema, kuidas politseinik, kes saab tulistada samal ajal kui lebab maas! Esiteks 7,62 kaliibriga oleks teinud tohutu segaduse lähedalt lasul, kuid ometi me ei näe seda !! A censored video of the Charlie Hebdo shootings is raising serious questions about the recent terror attack in Paris. In the shockingly non-graphic video below, which is meant to show French police officer Ahmed Merabet being shot in the head, you’ll notice there is no blood, gore or graphic violence. Pay attention to the sidewalk to the right of the officer’s head. Tsenseeritud video Charlie Hebdo tulistamisest on kasvatanud tõsiseid küsimusi senise terrorirünnaku kohta Pariisis. Selles sokeerivas mittegraafilises videos allpool , mis näitab prantsuse politseiametniku Ahmed Merabeti tulistamist pähe. Seal märkad, et videos puudub veri või igasugune graafiline vägivald. Pöörake tähelepanu kõnniteele ametniku peast paremale . This has provided many with a legitimate reason to doubt the official narrative taking shape around attack. We also know that a forth suspect linked to the terror attacks left France days before the event and is now in Syria according to French police. 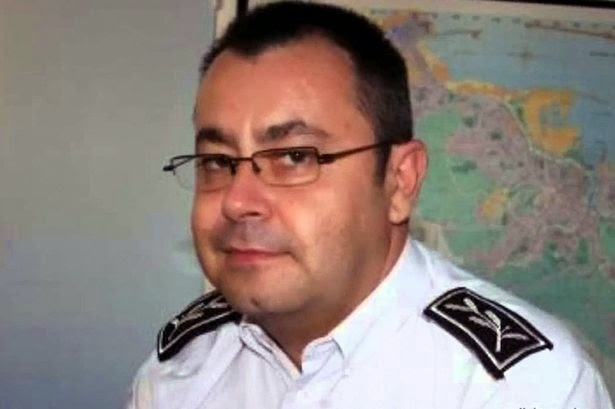 It is also important to note that it has only been a few days since the shootings and a senior police commissioner in charge of the investigation into the Charlie Hebdo shootings has already ended up dead. See on andnud paljudele andnud õigustatult põhjuse kahelda ametlikus narratiivis, mis on kujunenud rünnaku ümber. Teame ka, et neljas kahtlustatav- terrorirünnakutega seotud isik lahkus Prantsusmaalt päev enne sündmuse toimumist ja on nüüd Süürias vastavalt Prantsuse politseile. Samuti on oluline märkida, et on olnud vaid paar päeva pärast tulistamist ja kõrgem politseiametnik, kes oli Charlie Hebdo uurimise juhiks on surnud. What we do know is that this footage suggests the officer was likely not shot in the head by an AK-47 (a 7.62×39mm round), as claimed by the corporate media. I’m not here to tell you this is some sort of hoax, or what will be happening next. I am asking you to watch the video below with an open mind: SHARE !!! 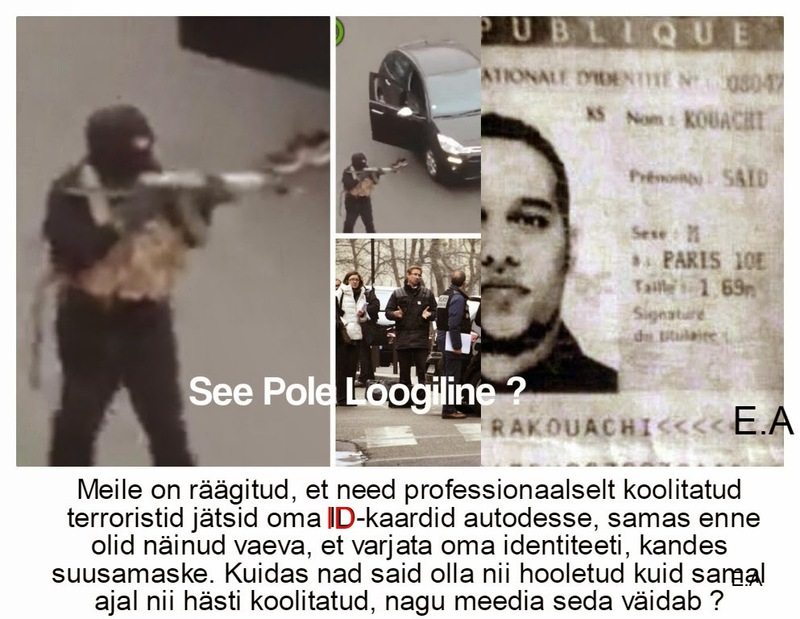 PARIS SHOOTING FAKE POLICE KILL from Estonian Anonymous on Vimeo. My first thought here was "ok, they missed". Just one problem. Every single mainstream media outlet is claiming that he was finished off with a shot to the head, and that's blatantly false. So then you have to ask, what else are they lying about? Minu esimene mõte oli siin "okey no ilmselgelt lasi mööda". Lihtsalt selle kõige juures on üks probleem. Iga peavoolu meedia väidab, et kuul lõpetas löögi pähe, ja see on laus vale. Siis sa pead küsima, mida veel on nad valetamas? Jordi Mir, the man who filmed the shooting while sitting alone in his apartment, now says that he regrets filming and subsequently posting the video to his Facebook account. Mir removed the video from his social media account 15 minutes after posting, but not before someone grabbed the footage from his account and posted it to YouTube. The amateur cameraman called the his decision to share the video on Facebook a “stupid reflex”. Jordi Mir, mees, kes filmis tulistmist oli parasjagu istumas üksi oma korteris, ütleb nüüd, et ta kahetseb, et filmis . Ta postitas video oma Facebooki kontole. Mir eemaldas video oma sotsiaalse meedia kontolt 15 minutit pärast postitamist, kuid keegi oli jõudnud võtta video tema kontolt ja panna selle YouTube'i.Amatöörist kaameramees pidas oma otsust jagada video Facebookis "lolliks refleksiks". In November Israeli PM Benjamin Netanyahu warned it would be a “grave mistake” for France to recognize a Palestinian state. 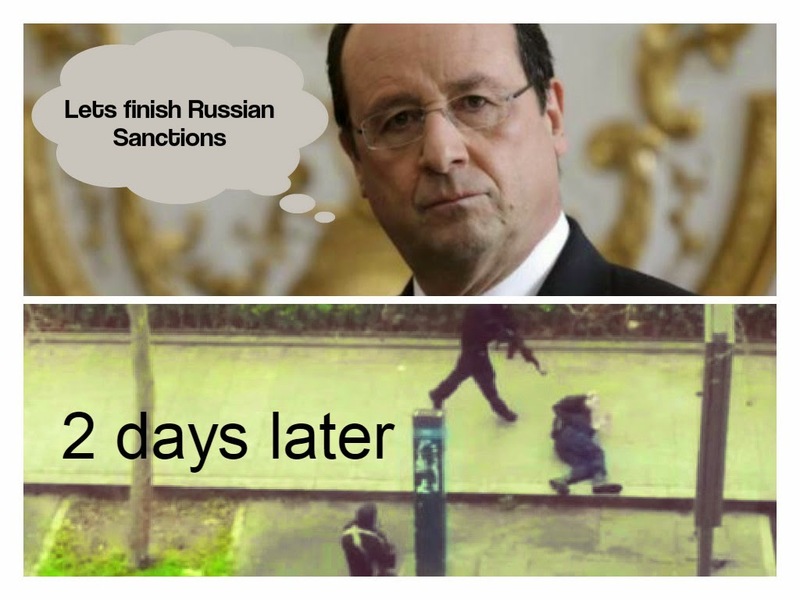 On Monday French President Hollande asked for Western sanctions on Russia to be lifted. Two days later, Paris was attacked. It appears that the Paris terror attack has bolstered the European right. Massive protests (over 700,000 today) continue to rage across France, while new support for the more militant anti-immigration policies of the National Front rapidly grows. Remember the American government under George W. Bush? Novembris Iisraeli Peaminister Benjamin Netanyahu hoiatas, et oleks "suur viga" Prantsusmaal tunnustada Palestiina riiki. 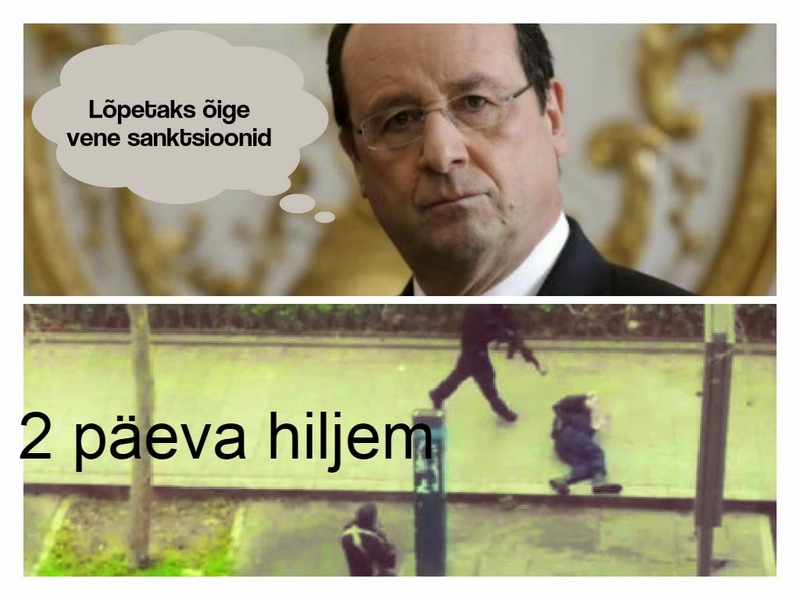 Esmaspäeval Prantsusmaa president Hollande palus, et Lääne lõpetaks Venemaal sanktsioonid . Kaks päeva hiljem, Pariisi rünnati. Tundub, et Paris terrorirünnak on tugevdanud Eurooplaste õigust. Massiivsed protestid (üle 700,000 inimese) jätkuvalt on raevus üle Prantsusmaa, samal ajal kui jätkub toetus sisserändepoliitika National Front jaoks. 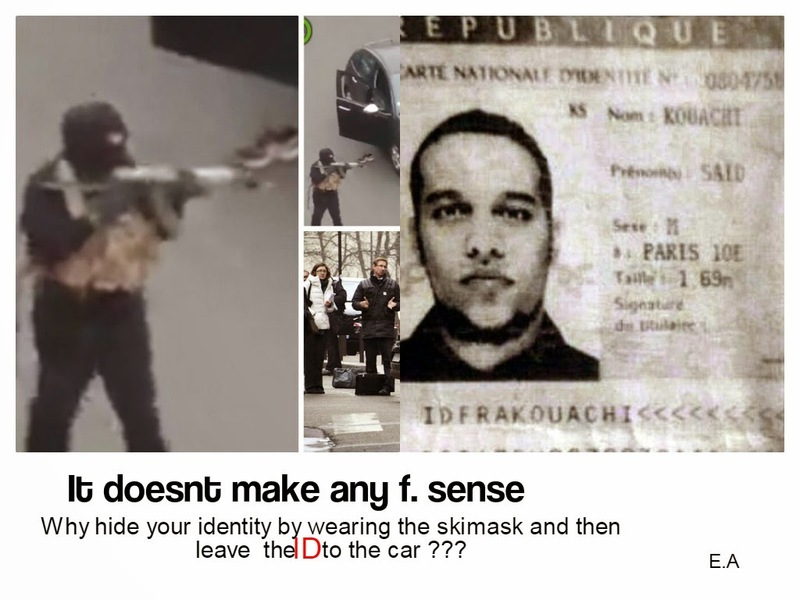 We’ve been told that these professionally trained terrorists left their identification cards in the getaway car before making an effort to conceal their identity by putting on ski masks. How could they be so careless and so well trained, as the media is reporting, at the same time? Meile on räägitud, et need professionaalselt koolitatud terroristid jätsid oma ID-kaardid oma autodesse, samas enne olid näinud vaeva, et varjata oma identiteeti, kandes suusamaske. Kuidas nad said olla nii hooletud kuid samal nii hästi koolitatud, nagu meedia on seda teatanud ? According to Reuters, in 2011 one of the Charlie Hebdo shooting suspects met with al-Qaeda leader Anwar al-Awlaki in Yemen. You probably recognize this name as the first American to ever be killed by a US drone strike. What you likely missed was that in 2012 the FBI admitted it knew in October of 2002 they knew Anwar al-Awlaki was returning to the US before they detained him and abruptly released al-Awlaki from federal custody. Vastavalt Reutersile, 2011. aastal üks Charlie Hebdo tulistamistes kahtlustav kohtus al-Qaeda liidriga Anwar al-Awlakiga Jeemenis. All of this becomes very interesting after reading an article published by Newsweek a few days ago about the role Saudi Arabia plays in terrorism and the 28 classified pages of the 9/11 commission report. Kõik see on muutub väga huvitavaks pärast lugedes artiklit mis avaldati Newsweekis paar päeva tagasi ja see räägib Saudi Araabia rollist terrorismis ja 28 salastatud lehekülge 9/11 komisjoni aruandes. 1) If fire caused Building 7 to collapse, it would be the first ever fire-induced collapse of a steel-frame high-rise. In this video you can clearly hear bombs. On tuli mis põhjustas Hoone number 7 kokkukukkumise ametliku aruande järgi . Siin videos on selgelt kuulda pomme. SHARE SHARE - JAGA JAGA !! !